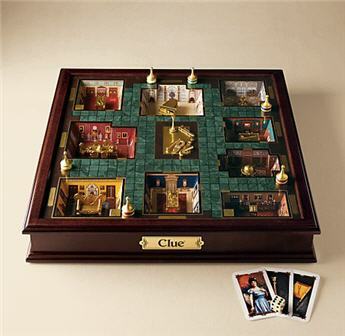 The Times Online asked its readers for short story submissions based on the game Cluedo (Clue, for you Americans). It got over 100 entries. The winning entry was posted online here. Miss Scarlett danced on to Mike’s lap. The chants of “going down, going down” stopped abruptly and Jack started to apologise. In his haste to gulp back his drink and get the glass on the table he’d managed to scatter the pieces everywhere. Reverend Green was now swimming in a puddle of alcoholic communion wine and Miss Scarlett was living up to her reputation.